The anatomy of a T20 is still being worked out. How important are the first 6 overs? Is a predominately spin attack the way to go, and how cute should you be with field placements? Making this match trickier to predict was that it was a women’s international, and it was played on a drop-in pitch that had been used three days ago. India showed they had a plan early by getting their slow bowlers to bowl wide of off stump to a 7-2 field. And there was no one behind a straight midwicket on the leg side. Arundhati Reddy was India’s sole seam bowler, and she bowled out in the 16th over. The rest was all spin. And their slow bowlers weren’t afraid to try the even slower ball; peaking at 53 kph (a dot ball). 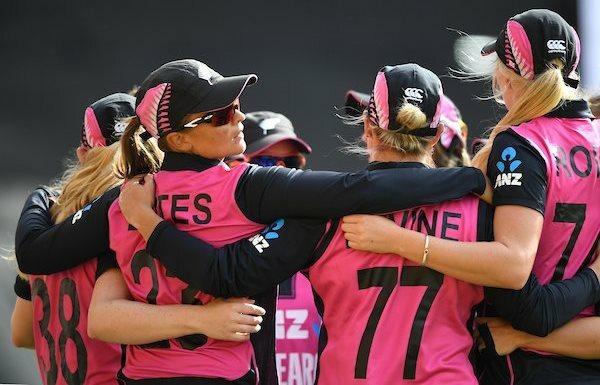 Devine and Satterthwaite reminded us of their class before both were dismissed playing very T20 shots towards the end. But Martin and Mackay finished the innings well, and a target of 160 seemed like a good one. But Mandhana can bat; we saw that in the ODIs. Her 58 off 34 balls looked to be cruising India to victory. India passed 100 for the loss of a solitary wicket, and the RRR was almost down to a run a ball. But a ripper of a catch by Rowe on the boundary saw her depart, and suddenly things changed. The following over Rodrigues was gone, and the wickets tumbled from there. Whatever the form of the game it is not easy to go out there and blast from the outset. Tahuhu even managed a maiden, just to reinforce things further. There was some resistance from Kaur, but otherwise it was one waay traffic. And once again over the last couple of weeks we had a side failing to bat out their overs. Just under 8,000 had passed through the gates by the end; easily the biggest crowd for a women’s cricket game in New Zealand.